“You’re doing what in Spain?” people ask when I first mention the Camino de Santiago. Most Americans I talk to have never heard of it. “It’s a pilgrimage walk through Northern Spain,” I explain. So instead of worrying that the movie will give the Camino the kind of publicity that changes it from a mystical experience to something superficial, I will just say thanks to Martin Sheen and Emilio Estevez for making my life a little easier. Now those of you that had never heard of the Camino will have something by which to understand what it is I’m doing. If you can’t make it to the movies, Rick Steves has a half-hour program on the Camino that you can watch by clicking here. 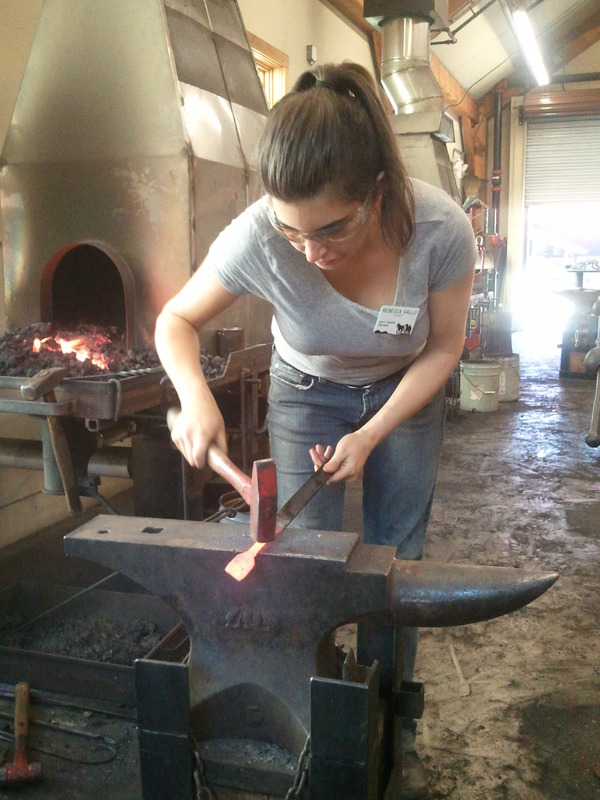 “So what did you think of blacksmithing?” friends ask. 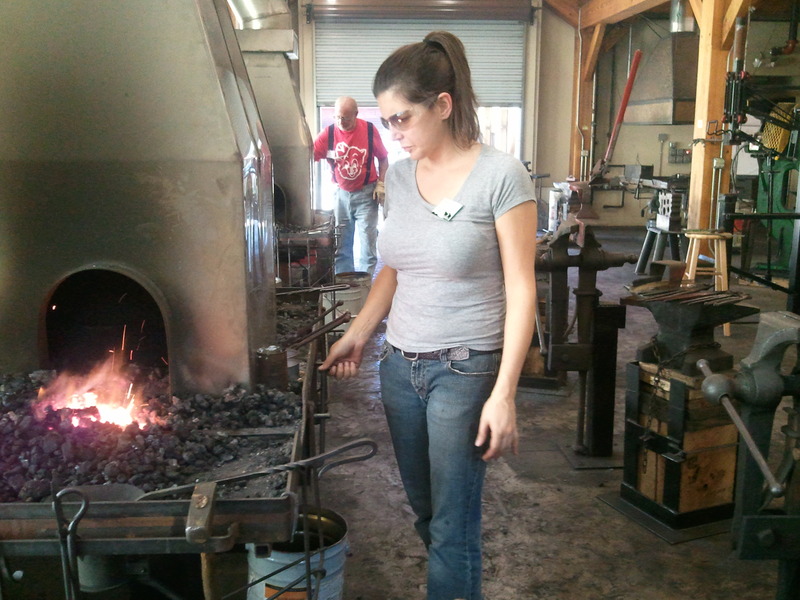 In my ten weeks here at the Folk School, I haven’t just been studying blacksmithing, or cooking, or writing. I have also been studying teachers, and myself as a student. During my years of “traditional” schooling, I excelled. Not because I was necessarily smart, but because I was good at doing what was asked of me: namely memorizing information and spitting in back out. I was also one of those kids who wanted to please the adults in my life – namely my parents and teachers – and so I did what it took. Thankfully, I’m mostly over my need to please other people. But not completely. Holding the beginnings of what would hopefully become a hook, I asked my blacksmith instructor what he thought of my work so far. “Well, do you like it?” he asked. “Yeah,” I said, wondering what that had to do with anything. “If you like it, it’s good,” he said. Wait – I determine what’s good here? At first it was a little alarming. I don’t know what I’m doing. How do I know if it’s any good? But then the idea started to grow on me. After all, I was the one that was going to take this hook home and use it. 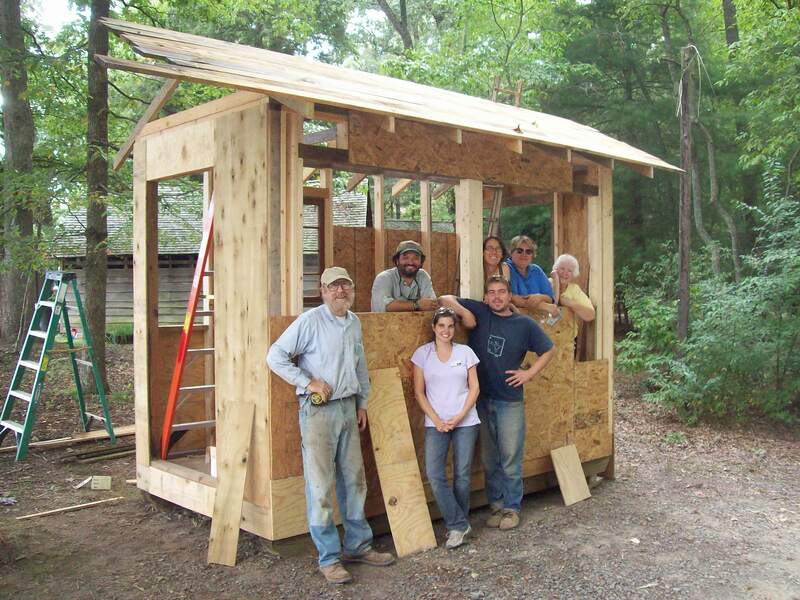 Last month, I took Tom Dahaney’s Building a Garden Shed class. In five days, we accomplished quite a bit. What was left undone, we were told, would be completed by the Work Study students with the help of the maintenance department. By Thursday afternoon, our shed was looking pretty good. On Saturday night, I had the pleasure of attending a wedding here on the campus of the Folk School. Our garden shed had never looked so good. 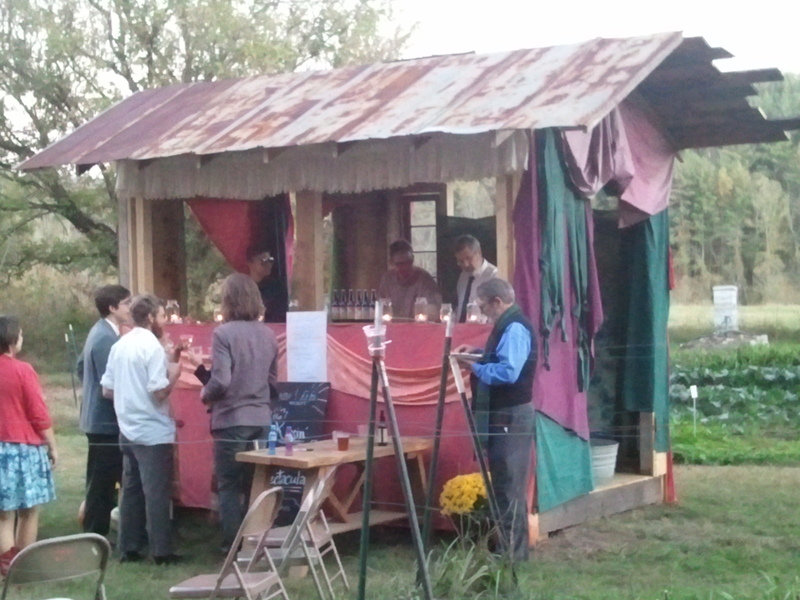 For it’s inaugural use, it served not as a garden shed, but as a bar. Beth and I went to sit down on the porch, overlooking the mountains. She took one rocking chair, I took another. “Oh – this is the one I don’t like,” I said as I got up and moved to another chair. Beth looked at the chair I had vacated and said, “Yeah, I don’t like that one either.” We conferred for a few minutes about what made one rocking chair better than another. Then we both paused for a moment, stared at the view, and Beth said, “I love that I’m living at a place where we actually rate rocking chairs.” I couldn’t have said it better myself. “You don’t have to do this,” my heard reminds me. Really? I ask, feeling a little lighter. So I closed out of the six windows I had opened on my computer in my attempt to figure out where to fly into to start the Camino. Maybe I don’t want to walk across northern Spain. Or maybe today just isn’t the day to make the decision. “So what exactly is a host?” my dining companions often ask when they see my position listed on my nametag. Where to start? I often wonder. My short answer is this: I live and work here in exchange for room and board and a class every week. The “class every week” part stops most people cold, as that sounds like heaven to many students here. I can see their wheels turning as they then ask me to elaborate on the “work” part. **Note: My co-host and I do some tasks together while others we alternate each week. 7:15: Eve leads morning walk – I get to sleep in. 8:05: I meet Eve in the kitchen for breakfast set up. We dish out the bread and syrup to each table, unwrap the brown sugar, yogurt, and raisins that accompany the grits we put out. 8:15: Eve rings the breakfast bell. Students stream into the dining hall, get their drinks, then stand behind a seat. Eve and I are back in the kitchen helping the kitchen staff to get the hot food onto the rolling carts. 9:00: We all (me, Eve, the students) head off to class. Except that this week, I’m not taking classes. But that’s a story for another day. 12:00: Morning class session is finished. 12:05: Meet Eve in the kitchen to prep for lunch. We put out salads, dressings, and bread. 12:15: Eve rings the bell. 12:20: Eve says the blessing. We serve lunch. Today it’s a Cobb Salad – with all the ingredients I expect of a good Cobb salad: avocados, egg, turkey, bleu cheese. Eve and I sit to eat, and talk about what we need to do the rest of the day. 12:40: I go to the microphone to do announcements. This afternoon, after classes are over, there’s a field trip to Blue Moon Elise – a shop in town that makes and sells soaps, lotions, and other potions. 1:00: After finishing lunch, Eve and I head up to the Community Room in Keith House to move chairs. There’s a cartoon drawing in my room that a former host did. A person stands behind a chair and the caption reads, “I sing behind the chair.” We move a lot of chairs as hosts. Today, we fold them and line them up in stacks of four against the walls to make room for tonight’s dance. 1:15: Eve and I take care of instructor requests. Today we move tables. An instructor requested a certain table in her studio, which we did on Sunday. But at breakfast she informed us she wanted two different tables, so off we go. 4:45: We depart the Folk School and arrive at our destination. 5:30: We depart Murphy to give me enough time to get back for my dinner duties. I drop the students back off at the Keith House and return the car to the gravel parking lot. 5:50: I meet Eve in the kitchen for dinner prep. You’ve got this part down by now. Tonight’s dinner: pasta with peas in a cream sauce. Bell, Blessing, Serving, etc. 6:50: Eve or I heads up to the Living Room to get out the DVD player and rearrange the chairs for the screening. 7:00: Dance. If you’ve been here before, you know what the food is like and the need for me to dance at least once a week. If you’ve been here before, you also know there’s a whole cast of characters at these dances, but that’s a story for another day. 8:15: Eve or I start the documentary. 10:00 (or 9:30 if I’m tired): I close the Keith House. You would think this means locking it, but you would be mistaken. “Closing” involves dumping the extra coffee and rinsing the pots, putting the newspaper in the recycling (a bench that opens – classes that need newspaper then go and grab it from there), closing some of the lights (but not all for fire safety reasons), and just all around making sure the first floor of the Keith House looks neat and inviting. “So have you made a lot of things so far?” my new co-host asked me. Having taken eight weeks of classes here at the Folk School, one would assume I have a cabinet filled with the fruits of my labors. I explained that I’m kind of a minimalist. It was the first time I’d used that word to describe myself but I felt like it fit perfectly. Scottish Cooking and An Abundance of Appetizers left me with delicious recipes. Nature Writing left me with some blog posts and stories – all stored electronically. And one hand-made book. My Building A Garden Shed class was tasked with creating a shed for the Folk School – nothing for me to take home except the knowledge that I’m not cut out to be a builder. From my Genealogy class, I gained a destination for my trip to Italy in March: Corigliano. It is in that class that I learned the name of the town my great-grandmother came from. I now own a copy of the ship manifest that shows her arrival in the port of New York on the Perugia on June 7, 1913. I have an eight-ounce cup full of Glass Beads, most of which I’ll donate to Beads of Courage. 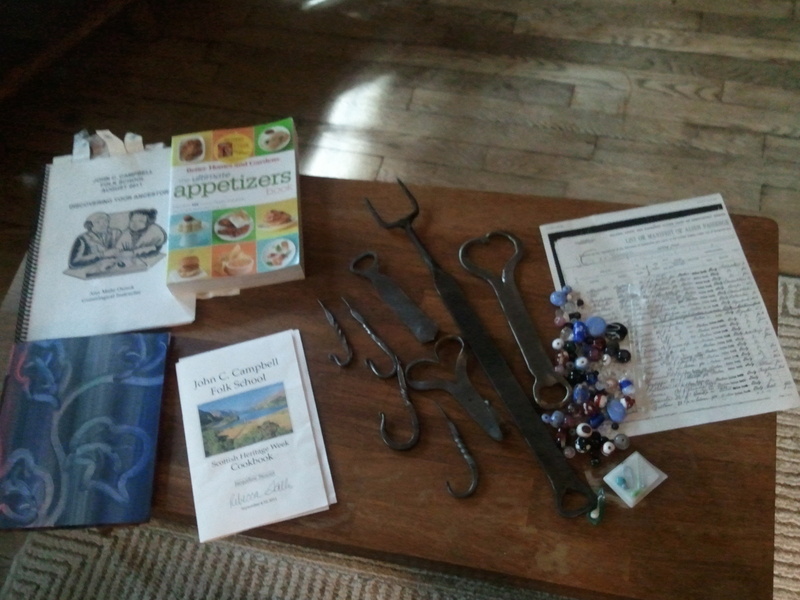 I made five hooks, two bottle openers, and a fork in my Blacksmithing class – all useful things either for myself or as gifts.